Unveiled at the AES Show in 1978, the Lexicon 224 was not the first digital reverb (that honor goes to EMT’s 250), but the 224 (and its 224X and 224XL cousins) was the most ubiquitous and popular high-end studio reverb in history. 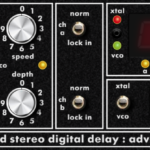 The Lexicon 224 is an early digital reverb that was well known for its spacey, extra long decays. Vangelis was an early pioneer of the extra long decays using this unit, most famously in the Blade Runner soundtrack. The reverb was conceived when Dr. David Griesinger, a nuclear physicist/musician/classical recording engineer, started working on a digital solution to reverb. Seeing EMT’s 250 encouraged him to merge a microcomputer with his reverb design. He pitched his rough prototype to Lexicon, which bought the invention and brought Griesinger on board to help refine the product. One of Griesinger’s concepts for the new reverb was creating a separate control unit for parameter adjustment and program access. The 224 reverberation system had a console-top controller with a four-rackspace brain, two inputs, four outputs and interchangeable programs to simulate chambers, plates and rooms. The 224 was “affordable” – meaning $7,500 with two programs or $7,900 with four programs. But at half the price of EMT’s 250, the 224 was a hit. Eventually, the 224 evolved into the improved 224X and 224XL, which included the LARC (Lexicon Alphanumeric Remote Control), offering fingertip access to programs and parameters, dedicated function keys and a 24-character LED. The Lexicon 224 used a fixed point processor, with a 16-bit word size. It was designed in the late 1970s using the best technology available, which at the time was the 8080 microprocessor, 12-bit converters (using DAC80 DAC IC), input transformers, and bucketloads of 74S/LS-series logic. Although the converters themselves are 12-bit, a clever scaling circuit gives an extra 24dB of headroom by actively shifting the input gain. This gives a 16-bit conversion range overall, though precision is still only 12-bit. Based on a reverb that gained wild popularity in the 80s and 90s, the Native Instruments RC 24 delivers larger-than-life ambience with stunning accuracy – right down to the 12-bit converters. From Talking Heads’ Remain In Light to U2’s The Unforgettable Fire, the Lexicon 224 remains one of the most popular digital reverb units of all time. Now you can track and mix with this singular piece of audio history with the Lexicon 224 Reverb plug-in for UAD-2 hardware and Apollo interfaces.